Addressing the theme of ‘The Consumer Challenge’, the 2013 Wine and Spirit Industry Association Annual Conference took place at BAFTA in London on Wednesday 25 September. Setting the scene, WSTA chairman Nick Hyde said: “Personal behaviours are changing, and they’re changing quite dramatically.” There is, he added, ever greater competition for the consumer pound. In keeping with another of the Conference’s themes, a highly informed view from outside the drinks industry was provided by the first guest speaker, Lord Black of Brentwood, executive director of the Telegraph Media Group. Describing the “remorseless impact of digital technology”, Lord Black summarised the dramatic effects on the newspaper industry of the advent and rapid rise of digital communications. As well as this, he added, both the newspaper industry and wine and spirits have to contend with negative portrayals in the broadcast media, such as “…pictures of irresponsible binge-drinking on the streets of some of our cities”. However, despite the difficulties it has faced, Lord Black said newspaper businesses have been “reborn as multi-platform digital operations”. “We are internationally recognised brands, and we are in the main facing the future with confidence and optimism,” he said. “The way forward for us had to be to become integrated digital businesses, but above all work within the grain of swiftly changing customer habits – to focus relentlessly on consumers in all their varieties.” And, he added, on the development of IT in all its forms. Building trusted brands is key to future development, he said, alongside new “story-telling methods” suitable for mobile and tablet, and making increasing use of videos, “the explosion of which is powering the market”. He cited the “huge growth in Facebook”, which he said has grown in a few years from nothing to 24 million active users in the UK, “83% of whom access the service from their tablets or smartphones”, while tablet ownership has “more than doubled in the past year, and more than half of owners say they couldn’t now live without it”. As well as developing efficient IT and speedy payment systems, Lord Black recommended that the wine and spirits industries should focus on: “Brand image and reputation, and above all understanding your customers”. Next on the speaker’s podium came WSTA chief executive Miles Beale, whose address focused on the WSTA’s main objectives for the industry. The first, he said, is to remain a positive voice for the wine and spirits industry. “While we have been good at talking to each other, we were much less good at explaining ourselves to a broader audience,” Beale said. He said that the successful WSTA campaign against minimum pricing, ‘Why should responsible drinkers pay more?’, will continue. The second WSTA objective is in the area of Corporate Social Responsibility – to support members’ efforts to encourage responsible drinking and effective CSR programmes. This includes continuing with Community Alcohol Partnerships, in conjunction with the police at a local level, and continued commitment to the funding of Drinkaware and to Public Health Responsibility Deal pledges including clear labelling of alcohol units and health guidelines. Beale also touched upon the issue of Packaging Recovery Notes “It’s a good example of something that trips off the tongue, as PRN, but what do we actually mean by it? The WSTA has, along with British Glass and others, pushed for a review, he said, which is due to report to ministers on 2 October. The WSTA also became involved in the last year, Beale added, in talks over trading in China, in which the issue of phthalates, or plasticisers in packaging, was included. Concluding, Beale said that the WSTA’s third objective is to ensure its members’ views are heard by policy makers at all levels of government. Aimed largely at a drive towards a fair taxation system, Beale said that in practical terms, this currently means “getting rid of the duty escalator”. He admitted, however, that this may be “an ambitious target”. 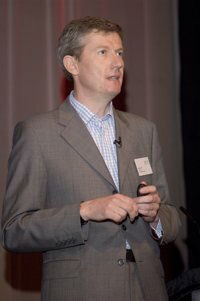 Third and last of the WSTA Conference speakers was Barry Clark of consumer trends forecasting company Future Foundation, who discussed the many ways in which developments in digital behaviours are, or may in the future change the “consumer landscape”. According to his company’s research, Clark said that consumers are becoming increasingly risk averse in their choices, while at the same time placing much greater value on “time and experience” as the new definition of ‘luxury’. Clark described new online consumer phenomena such as a “New collectivism”, the inherent power gained by groups of people coming together to form buying groups, or ‘crowd purchasing’; and “Hyper individuals”, often younger people who are equipped to compare prices for a product between retailers while at the point of purchase, via their smartphone. Clark pointed to “the end of adventure” and “an era of curated discovery”, as home- or office-based consumers hand decision-making processes over to online entities who make a business out of doing the searching for you: “Smart agents”. The trend, he added, is now moving away from internet users seeking the advice of amateur online bloggers, and back towards “expert advice” – good news, and an opportunity, it might seem, for companies, marketers, journalists and professional writers. Clark also described the “problem of choice” for internet shoppers. Research shows, he said, that 34% of people think there is “too much information to process when making purchases”, with the figure higher for 16-34 year-olds at 46%. Call this writer old-fashioned, but that sounds remarkably similar to walking into a shop where you know you can ask and trust the advice of a knowledgeable staff member. But such staff need training, which needs investment by companies, which in turn means businesses that reap a decent margin – which is perhaps at odds with the internet-led drive to the kind of ‘lowest price-only’ purchasing that’s the mainstay of online shopping search engines. That’s a model that the wine trade already knows, to its cost, is not sustainable in an industry in which the quality of the product itself, regulated as tightly as it is, is so important.